Inn! History Fort Lauderdale, proud steward of our community’s past by making our heritage accessible and engaging to residents and visitors, is commemorating the date of December 10, 1918, when Andrews Avenue in Fort Lauderdale received its first street lights powered-up by the Bryan Electric Company. Enjoy a special Holiday Cocktail & Member Reception from 6 p.m. – 8 p.m. featuring wine, hors d’oeuvres and sweet treats as our campus twinkles and glitters with traditional holiday decorations and musical sounds of the season. Sponsored by ARM Electrical Services, LLC. During its annual Pet Nights with Santa event, Dolphin Mall will offer pet parents a chance to celebrate the holiday season and visit with Santa on Wednesdays, Nov. 28, Dec. 5, and 12 from 7:30 p.m.– 9 p.m. at the holiday Santa’s Flight Academy attraction located on the second floor of Ramblas. A variety of photo packages are available for purchase, each will include a complimentary Lovepop card. Please note that pets must be up-to-date on their vaccinations and must either be on a leash or carried in a lightweight, portable pet carrier with harness. For more information on holiday events and promotions, visit www.shopdolphinmall.com/events. photo package on Pet Nights with Santa (while supplies last). WHERE: Dolphin Mall – Santa’s Flight Academy attraction located on the second floor of Ramblas. Santa welcomes children of all ages and abilities! This compassionate, sensory-friendly event allows families with children with all spectrums of special needs to experience the time-honored tradition of a Santa visit, in a comforting environment prior to public hours. Accommodations are made to support the sensory, physical, and developmental needs of this special audience. A portion of proceeds from photo packages purchased will benefit Arc Broward. Keepsake Santa photo packages start at $24.99. Space is limited and families are encouraged to reserve a time in advance. For more information, please call (954) 564-1036 or visit www.galleriamall-fl.com. 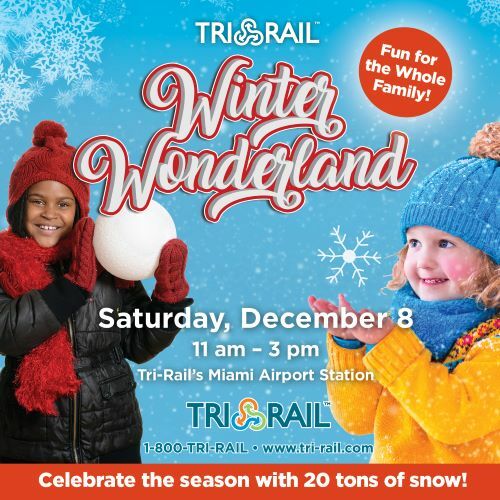 Celebrate the season with 20 tons of snow at Tri-Rail’s Winter Wonderland celebration. In addition to the highly-anticipated snow playground, attendees will enjoy bounce houses, food trucks, face painting, cookie decorating, a coloring station, holiday carolers and more. Admission to the event is FREE. Event goers are invited to start their day of fun on two select trains, southbound P669 and P671, both departing from the West Palm Beach station, at 9:50 a.m. and at 10:50 a.m., respectively. The two-hour trip will feature costumed characters on board to entertain riders. Tickets are $5 to ride Tri-Rail the entire day or $2.50 for students, seniors, and persons with disabilities who have a registered discount EASY Card. Kids 12 and under ride free. • Jan 17, 2019…..7 p.m.
• Jan 18, 2019…..7 p.m.
• Jan 19, 2018…..11 a.m., 3 p.m., 7 p.m.
• Jan 20, 2018…..1 p.m. , 5 p.m.
• Jan 21, 2019….3 p.m.
Santa’s Flight Academy, a one-of-a-kind, immersive experience that culminates with a special visit with Santa, will return to Dolphin Mall from November 8 through December 24. The holiday attraction merges the physical and digital to provide a personalized adventure for every child. Set within the North Pole, each ‘cadet’ will receive an official flight crew badge and be instantly recognized by name upon entering Santa’s Flight Academy to become an elite member of Santa’s flight crew. From there, cadets are fitted with a virtual flight suit and will partner up with a helpful elf to inspect and power Santa’s sleigh and navigate the best course for the big day. The experience culminates with a snowfall dance party and, of course, time with Santa who will greet his crew members personally by name. Though not required, customers are highly encouraged to create flight crew badges in advance of a visit online or through the center’s mobile app (for iPhone/Android). Badges can also be created onsite at special Santa’s Flight Academy kiosks. Santa’s Flight Academy is free and a variety of photo packages are available for purchase, each will include a complimentary Lovepop card. The Miami Flea brings together local artisans, live music and good vibes for the community to enjoy. Join us on the third Sunday of every month to check out artisans who specialize in vintage, handmade, homemade, health, small batch food and beverage items. On Saturday, November 24th from 1pm to 3pm, celebrate with us and St. Nick to start getting into the Holiday Spirit. Enjoy music, giveaways, face painting and fun activities for the kids. Special performance from Trixie the Holiday Pixie at 2pm! Local high school and college students are organizing the fifth annual “Scaring for Caring” Haunted House supporting Big Brothers Big Sisters of Miami (BBBS), UHealth Jackson Children’s Care and Holtz Children’s Hospital. Join these students as they transform their family’s Miami Shores home into a 1950s-inspired Haunted Village of Miami Shores, complete with live actors, mirrors, mazes, spooky mannequins along with other interactive features. Scaring for Caring organizers expect this year’s events to bring total funds raised since 2014 to over $1 million. Shops at Merrick Park invites families and children of all ages to attend its spectacular 15th Annual Tree Lighting Ceremony with Santa’s Arrival, sponsored by Nicklaus Children’s Hospital. The evening’s free festivities include the grand tree-lighting reveal, live entertainment, retailer pop-up stations and a special appearance by Santa Claus. Shops at Merrick Park will transform into a winter wonderland centered around an impressive 50-foot tree adorned with 55,000 colorful twinkling bulbs. The magical evening will begin with Santa’s grand arrival down San Lorenzo Avenue on the Coral Gables Fire Department’s fire truck where Master of Ceremonies Belkys Nerey, award-winning co-anchor of WSVN Channel 7 News, and Coral Gables Mayor Valdes-Fauli will join in to illuminate the tree, signaling the official start of the holiday shopping season. Attendees will be treated to live performances by the Miami Royal Ballet and greetings from holiday characters, a refreshment station, giveaways and more. A roster of retailers will also pop-up throughout the garden with special promotions and gifts. Attendees are encouraged to bring unwrapped toys for children in the care of Nicklaus Children’s Hospital and in doing so they might be the random winner of exciting prizes from Shops at Merrick Park. Children dressed up in their halloween costume will receive a free mini cupcake! & every 4 legged friend will receive a Bark -O- Boo! Celebrate Cupcake World’s first birthday on Sunday, November 18th, 2018 as they welcome guests with free cupcakes, gelato, or a glass of Rose wine, while supplies last. Doors are set to open at 2:00PM until 5:00PM. Also, during Cupcake World’s 1st birthday party, guests can expect live music and fun photo opportunities including an extravagant balloon arch. It is likely to be a fun, family day. Join award-winning, Miami-based musician and children’s author Kim Cameron for a family-fun storytime event hosted at the Miami-Dade Public Library System, Miami Springs Branch! Kim Cameron’s Seaper Powers is a whimsical series of illustrated adventure books, perfect for children ages 5-9! Young readers will embark on a magical journey of imagination and ocean adventure, along the way discovering positive messages about self-confidence, friendship, and environmental conservation. The Seaper Powers series received Honorable Mention in the 2018 Purple Dragonfly Book Awards, recognizing outstanding children’s literature. Head to the Miami Springs Branch Library and join a fantastical cast of sea-critter friends as they uncover buried treasure and solve exciting mysteries! Admission is free and open to adventurers of all ages. Author Kim Cameron will be available for autographs and meet-and-greet, with books available for purchase. Head to the Coral Gables Branch Library and join a fantastical cast of sea-critter friends as they uncover buried treasure and solve exciting mysteries! Admission is free and open to adventurers of all ages. Author Kim Cameron will be available for autographs and meet-and-greet, with books available for purchase. In honor of Breast Cancer Awareness Month, the Pink Heals Tour is making a momentous stop in South Florida, offering support for victims and families of victims who have been impacted by the disease. Pink Heals is a firefighter program that travels the country in a caravan of pink vehicles, including fire trucks and SUVs, raising awareness and support, even offering home visits to show individuals they are loved and cherished. Española Way, the iconic pink, Mediterranean-inspired street on South Beach, is hosting an arrival celebration for the Pink Heals Tour, and a portion of the merchants’ proceeds will go back towards supporting the organization. Guests are welcome to walk the beautifully lit street, dine at more than 10 restaurants, shop at specialty boutiques and enjoy a live Opera performance at 8:30 p.m. Talented kids from Miami-Dade, Broward and Palm Beach counties are invited to The Galleria at Fort Lauderdale to audition for “South Florida’s Kids Got Talent,” a singing competition held as part of Tri-Rail’s “Rail Fun Day.” The competition is open to solo or group singers who are South Florida residents ages 5-17. Each act will have a 4-minute opportunity to perform at the auditions. A panel of judges will select the acts that will compete in the final competition during Tri-Rail’s 11th Annual “Rail Fun Day,” a free family event on Saturday, January 26, 2019. Only one act will be selected to win the $500 grand prize. Advance registration is required by calling GPR at 954-446-0813. Deadline to register is Wednesday, November 14. The MICFF returns! Culturally rich, entertaining, & inexpensive fun, the Festival provides three days of acclaimed international cinema for children & families, featuring local premieres. The Festival cultivates critical appreciation for intelligent films among kids, while educating & entertaining. There will be Family Fun on the Plaza, an Opening Night Reception, & more! Join us on the Plaza directly in front of the Gables Cinema. Fun for the whole family to enjoy before and after the films with face painting, balloons, music, a dance party and more. This event is free and open to the public! Synopsis: A collection of short films from Latin America, selected by the 2018 New York International Children’s Film Festival and Mexico’s Morelia International Film Festival. Dolphin Mall, Miami-Dade County’s largest outlet and retail value shopping center with more than 240 value-oriented stores, located five miles west of Miami International Airport. It’s all treats and no tricks at Dolphin Mall’s annual “Spooktacular” Halloween Party, taking place on Wednesday, Oct. 31 from 5:30 to 9:30 p.m. The event features music, dancing and games for the whole family to enjoy. As part of the celebration, face painters, balloon artists and magicians will be located throughout the mall as kids participate in the mall-wide trick-or-treating. Bring your coolest costume and participate in the optional costume contest for a chance to win a gift card. This family-friendly event is free and open to the public. For more information, visit http://www.shopdolphinmall.com/events. Wednesday, Oct. 31 from 5:30 to 9:30 p.m.
Everyone’s favorite family of superheroes is back in Incredibles 2. Join us as we learn how to make Jack-Jack’s favorite Num Num Cookies and a scrumptious handmade Berry Milkshake. We are thrilled to partner with our friends at Disney-Pixar to bring you this fun-filled special event. Grab your little superhero, your creativity and let’s get cooking! This class is designed for kids and parents to cook together! $28 per child w/ one caregiver included. Partnered with Bots for All, the Junior Orange Bowl Robotics competition, officially sanctioned by Vex, orchestrates teams of young South Florida engineers, grades 6-12, with the opportunity to master their skill and creativity for innovation in the Vex and Vex IQ arenas. The winning teams will not only take home the trophies for their category, but will also qualify to compete in the National Vex Competition in 2019. In recognition of their service to our country and community, “Salute to Heroes” Week offers all veterans, police, fire, law enforcement, EMT personnel, military personnel, power and utility workers free admission to Miami Seaquarium, November 5 through the 11th. A valid military, first responder or Power & Utility Worker photo I.D. is required and must be presented at the ticket counter. All accompanying family members – up to four guests – will receive 50 percent off admission. Jungle Island now features new attractions, activities and food offerings with much more to come.